It’s a few days before Christmas and I still haven’t made any of the allergen free Christmas cookies that I make every year (a great basic recipe can be found here), I still haven’t posted the Maple Sweetened Cranberry Sauce that I created for Thanksgiving, and I’m just now getting to posting this….luckily, like the original 1950s recipe, this gluten free, dairy free, soy free, nut free Green Bean Casserole recipe has only a few ingredients! Looks yummy huh? I’m constantly experimenting to try and make some of my favorite childhood recipes not only healthier but also gluten free, dairy free, soy free, and nut free. Throughout most of the year it’s fun. Around the holidays, I start to feel a bit overwhelmed. 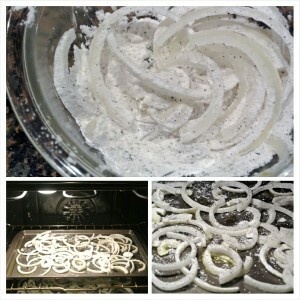 So many recipes, so little time! 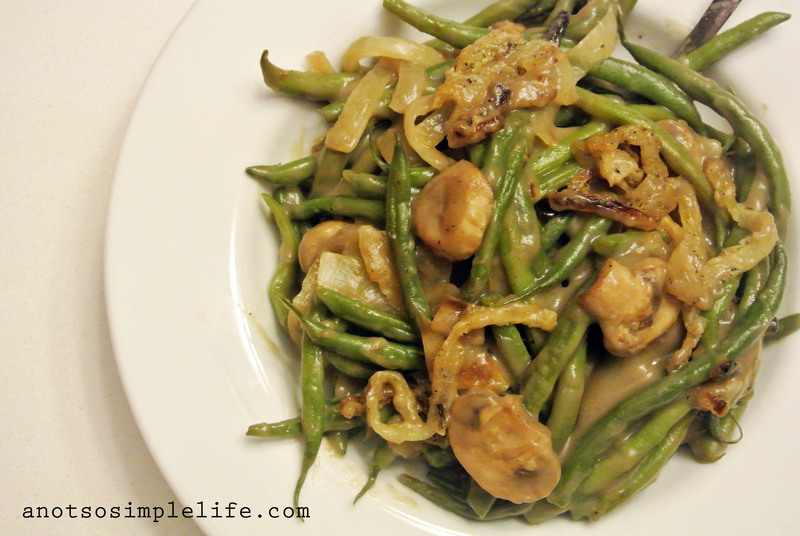 So when Aloha’s social media started looking for inspiration for a gluten free, dairy free, soy free, nut free spin on a dish to pass, I decided that I would take this opportunity to FINALLY test out the gluten free, dairy free, soy free, nut free green bean casserole recipe I’ve been dreaming up. Feel free to check out their website for more healthy recipes, here – take note though that they are not all allergen free so be sure to thoroughly check the ingredients! Also, if you are thinking about using their products be sure to pay close attention to the ingredients. If you can’t have legumes (like me), a lot of their products have peas and also use chick peas (for vitamin k). Like I said, my nightmare! It literally makes me queasy when I read those ingredients! So what’s in my recipe? Check it out for yourself! Just to let you know, this post may contain links to affiliate pages. I receive a small kick back from these purchases which I use to help cover the costs of maintaining this blog. You don’t get charged more for making a purchase through these links so I would really appreciate it if you make your purchases through them. You can read my full disclosure here. Thank you! By now the pot of water for the green beans should be boiling. Season the water with about a teaspoon of salt and dump in the green beans. Boil for 10 minutes. In a saute pan, cook mushrooms in a little avocado oil until fully cooked. 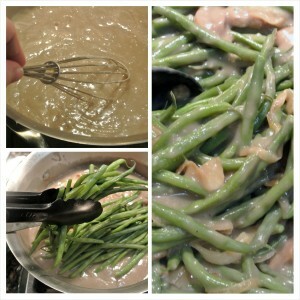 Drain green beans and place them into your casserole dish. In the same pot you boiled the green beans in, add the carton of Creamy Portabello Soup and bring to a simmer, stir in coconut aminos. In a small bowl, whisk together one ladle of the soup and 3 tbsp of sweet rice flour. Whisk mixture into the pot. 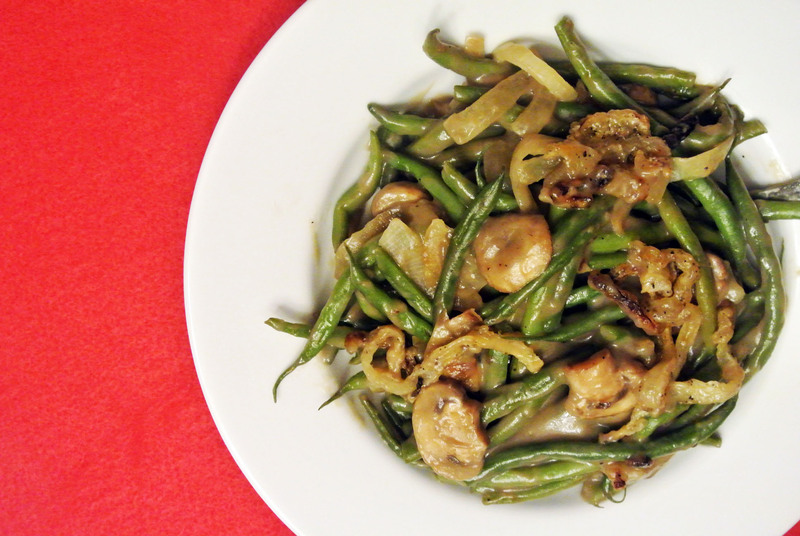 Once thickened slightly stir in mushrooms and green beans, gently fold in 1/2 of the “fried” onions. 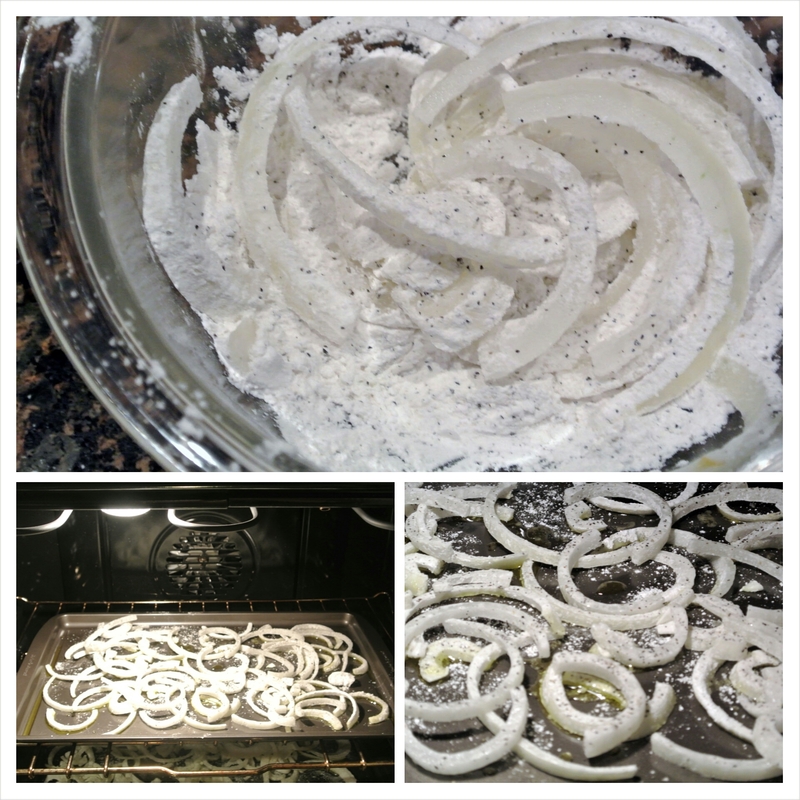 Place into your casserole dish, top with the other 1/2 of your fried onions and bake for 20-25 minutes at 400 degrees. Enjoy!